Someone so aptly said that and I am the first to put such pearls of wisdom to practice. It was the beginning of summers in late April of 2016 when I found myself in the middle of countless client workshops and maze of corridors at the client headquarters in Tacoma, Washington. 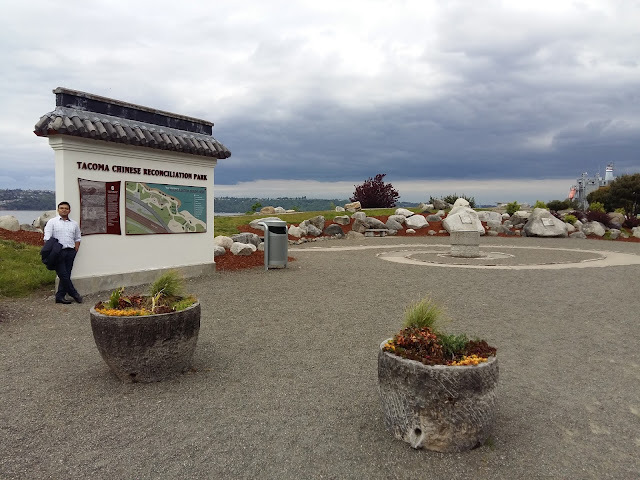 I was visiting the United States as part of a client engagement and had ended up being in Tacoma, a suburb about an hour away from Seattle, for most of the two weeks, I was in the country. Now, the touristy worm within me could not avoid me being in Seattle for the weekends (about which you can read more at – Link to Seattle Blog). However, living by the saying above, I decided that weekdays cannot be about work alone too. Hence, I had a list of places to be covered in the town during one of the sunny days through the working weeks. 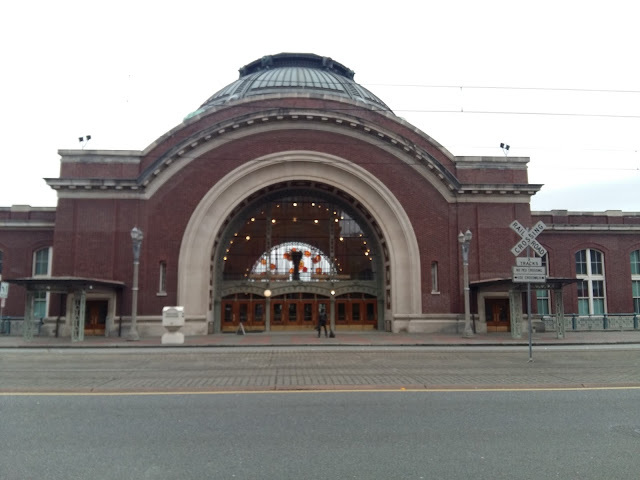 Incorporated in 1874, Tacoma, Washington is the third largest city in Washington State with a population of about 200,000. Tacoma is located in western Washington on Commencement Bay, off the southern tip of Puget Sound. On my first evening in the city, which was on the 25th of April 2016, I ventured out of the hotel to get a look at the city from close quarters. The hotel for the first week of our stay in Tacoma was, Hotel Murano. It was a nice hotel which was developed into a glass museum. Every floor had one of the glass artifacts along with a description of its history and picture gallery of how it was made. Other than these, there were numerous wonders of glass that donned the corridors and ceilings of the building. This itself was a point of attraction in itself. On my walk, that evening, I walked in the area around the University of Washington. This was the center for all the activities that we once were part of as college students and nostalgia was bound to set in. 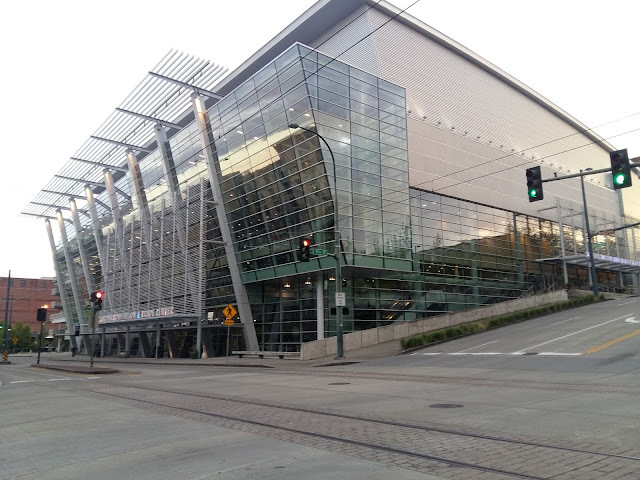 I passed through the big colorful building of the Convention Center and walked through the Washington Art Museum and the State Museum. To end the day, I had a filling Mexican dinner at a local joint – Mexican Magic - right beside the hotel. People here in the US have early meals and most dinner places close out by 9 PM. A few like this one open until 10, after which it is difficult to get food – even the hotel restaurant closes and so do most of the eat24 options in this small town. Coffee is huge and the room coffee is of good quality itself. Next few days were devoted purely to work and we had lots of meetings and loads of tasks. On Wednesday, we went for a team outing to the Forum and had a light dinner. Thursday brought with it – good news in more ways than one. It was a beautiful sunny morning and the day promised brightness and light. It was such a good weather to roam and explore the city and we did not want to spend it in the confluence of meeting rooms. Pondering on fitting everything on our mind within the hours of the day, we got a pop up on our screen which lightened all of us – due to a client conflict, our afternoon meeting was canceled. We were on our toes in no time and talked to our manager about the plans. He was all up for it. In fact, to better it up he took us to all the good places in town and showed us around and then dropped us at the waterfront to have the evening to ourselves. We took a long walk along the waterfront. There were multiple piers beautifully situated to provide the best of views of the skyline across the lake. There were numerous parks, carefully manicured and well maintained to relax on the way. We also visited the Tacoma Chinese Garden and Reconciliation Park which is a site for beautiful park developed to showcase the city’s commitment to fighting racism, hatred, and violence. Then we Uber’ed into the city and visited Fireman’s Park which also had a memorial for firemen who lost lives in the line of duty. Then we had a great dinner at Matador – a premium Mexican restaurant. This place had a wonderful setting and was more a romantic place but the food was perfect and I decided to come back to it for another meal sometime later during the visit. On Friday, we had meetings in a new town – Gig Harbor which is a small countryside town. 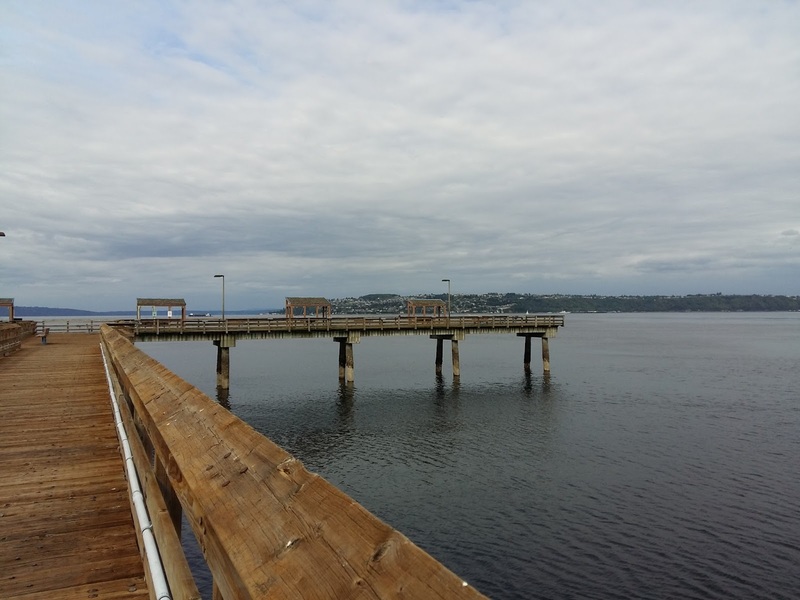 Gig Harbor is one of several cities and towns that claim to be "the gateway to the Olympic Peninsula". The Pierce Country town is popularly called the Maritime City and is house to the calmness and serenity of the countryside. Next week, between works I made time to touch upon a few other tourist attractions of the city. This is the city of glass works and hence, one important establishment to cover is the Museum of Glass. This museum showcases beautiful exhibits of art and culture and is dedicated to celebrating studio glass movement through nurturing artists, implementing education, and encouraging creativity. The next point of interest was the Bridge of Glass. The Chihuly Bridge of Glass is Tacoma's stunning link to the Thea Foss Waterway and the Museum of Glass. The 500-feet pedestrian bridge holds three amazing Chihuly glass installations, open to the public 24 hours a day. A look of the bridge and its artifacts in the setting sun could humble the most romantic places in the world. 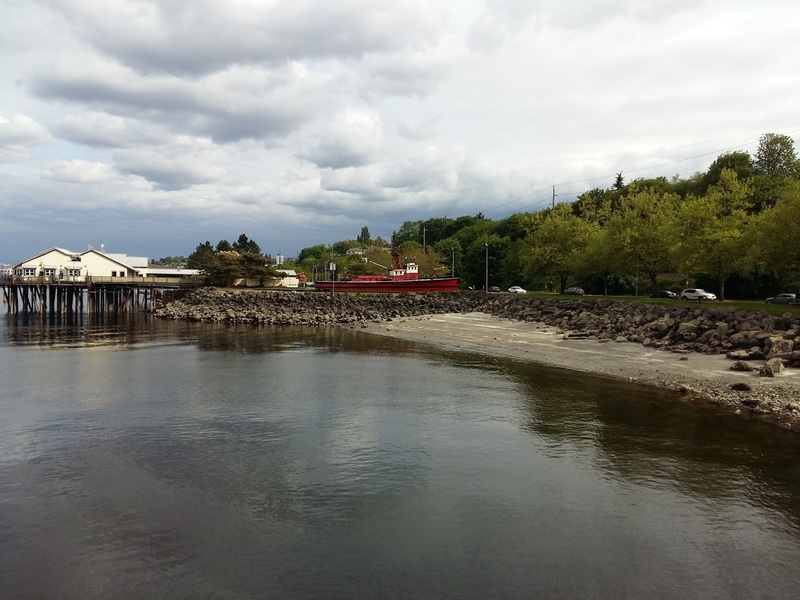 We also found time to squeeze in a quick visit to Point Defiance Park which covers a large area and has a number of gardens, zoo, and an aquarium. We spent the last day of our stay in the town to enjoy dinner at a waterfront restaurant - Duke's Chowder House. Though the place is known for its seafood, they had a great staff which managed to serve a couple of vegetarian recipes for me. Later that day, we spent time souvenir shopping to carry some memorabilia from the city. We moved out of Tacoma on Friday, May 6th, for good and left for Seattle. It was a wonderful stay in this town for two weeks and I carried with me beautiful memories to cherish for a long time to come.